There’s been a lot of restaurants that venture into incorporating pork into their local dishes. And MyBanana is one of them that you definitely want to try. For those who are on the lookout for the best banana leaf rice (with a porky twist, that is), this might be THE ultimate one. Known for their glorious Siew Yuk that’s usually paired with their standard and traditional Banana Leaf Rice with a choice of fish or chicken curry, you will also get an assortment greens selections such as cabbage, cucumbers and curry-okra that serve as the perfect palette cleanser. 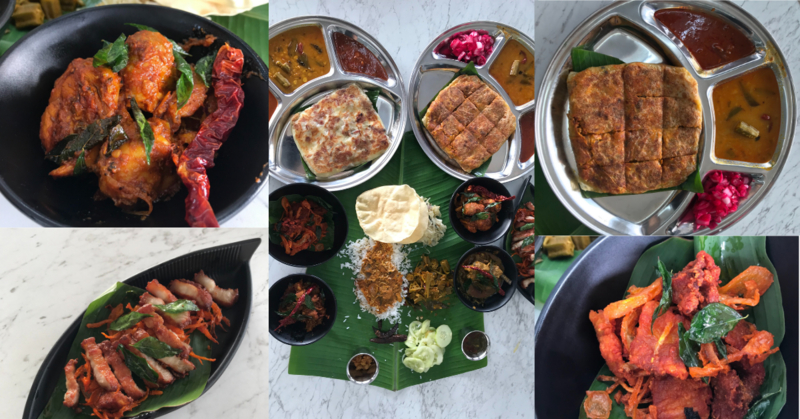 The familiarity of the Banana Leaf Rice has us salivating and on the edge of our seats on the dishes that Chef Prakash, the Director of Food (no pun intended) has orchestrated for us. In all honestly, after a long week of work, the team were unprepared for the swarm of rustic and delicious porky-punch and our tastebuds were floored. Here are the top 7 things you ought to try the next time you visit MyBanana! Watch MyBanana take this Roti Cheese classic for a spin, with a surprise of smokey bacon streaks causing this total-genius commingle of classic buttery flatbread, cheese and bacon. Definitely a recommend, if you want the safe option. Don’t be deceived by this egg, vegetable and minced meat concoction! At first glance, it might look like your typical murtabak, but as you tear into its omelette-pancake goodness, there’s bits of finely minced pork and onions. As you take a bite an intense spice and aroma explodes, you’d be thankful for the fatty richness of the pork to counter-balance the intense frenzy of spice. A massive triumph! We could not stop fighting till the very last piece. Pork-Belly Masala was a taste of viral porkiness, so addictive it resembles of a delicious pack of chips in a cheat day. It’s crispy and salty and the depth of earthiness from the fried curry leaves and the compliments of the sweet onions, that’s been cooked down with the pork and masala is just a bowl of heaven. Chef Prakash takes us for an oriental spin with this classic Chinese Nam-Yu Fried Pork. Recommended for anyone who prefers a more upfront pang of pork, compared to the Pork-Belly Masala. The fenugreek seeds and cumin play really well with the versatile poultry of chicken. Paired really well when eaten with the banana leaf rice, the tender morsels gives us a great mouthful and had us going for second, thirds…hundreds. This one took us over by surprise, how the strong gaminess of wild boar can stand up to the strong spices used for this dish. The Wild Boar Varuval made the underrated curry leaves sing as it made the pepperiness of the curry leaves stand out and brought such a different dynamic in terms of protein, than the usual mutton, beef, or chicken. Definitely would recommend this dish if you’re feeling gastronomically adventurous. Fork-tender pork gives a richness to the curry that we did not expect, and we appreciate that the heat of this dish does not overpower the taste of the pork as it is subtle and tickles at the back. BONUS: MyBanana also serves beer so if you’re looking for a change from the Limau Ais and Teh Tariks, have no fear! So call up your friends now and head your way to MyBanana, because their new menu is guaranteed to blow you away!